Multicultural. The buzz word for policies, companies, employment opportunities and that sort of thing. It’s also a fairly apt description of human life in London. I’m currently studying a Master’s at LSE and, out of the 200+ in the department, I’ve so far encountered three Brits. We are rare specimens. German, Taiwanese, Chinese, Puerto Rican, American, Thai. These were my companions and I found myself in a karaoke booth at the back of a Japanese second-hand manga store, wailing down a microphone and murdering every song I attempted. Afterwards, it was time to eat and time to give poor India some representation: we’d reserved a table at Dishoom, self-described as a Bombay Café. Things didn’t exactly get off to a smooth start. We were twenty minutes early so we were given a buzzer to wait at the bar whilst our table was prepared. However, we could clearly see our table, beautifully laid, across the gigantic and completely empty restaurant. We pointed this out and were very reluctantly seated, but the incident left a bad feeling like they were just trying to push drinks at the bar. To make matters worse, when our waitress for the evening arrived, she’d apparently been instructed to inform us – in a very friendly manner – that it was their policy not to seat parties until everyone had arrived, but it was OK today because the restaurant was empty. Which made no sense, because a reserved table is a reserved table – or so one would hope. Rant over! We didn’t stay disgruntled for long and had a really good evening all round. In fact, Dishoom is the kind of place where it’s impossible not to have fun. Its décor is bright but not loud, and apparently it doesn’t stay empty for long. We were seated in an alcove table, which is perfect for groups of 6 to 10 people, and it made dish-sharing wonderfully easy. It’s the kind of place which encourages relaxed munching and much laughter with friends. I found the menu a little strange. 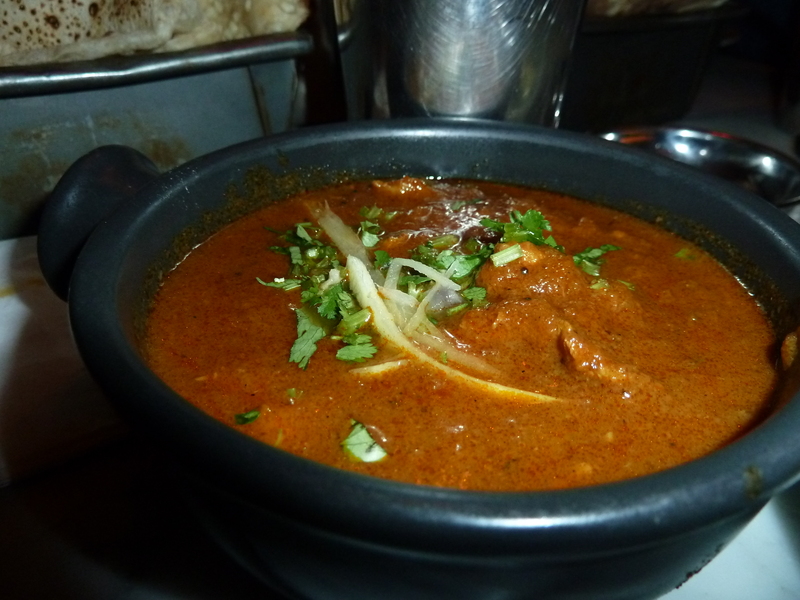 It focuses on Bombay snack food, grilled meat and naan bread, and includes very few vegetable side dish options. There are only three wet curries on the menu, which is bizarre given that naan bread, in my opinion, needs to be eaten with some kind of sauce or relish! However, I’ve not been to Bombay or a Bombay café so I can’t comment on how usual it is. First off, we ordered a range of exciting drinks. 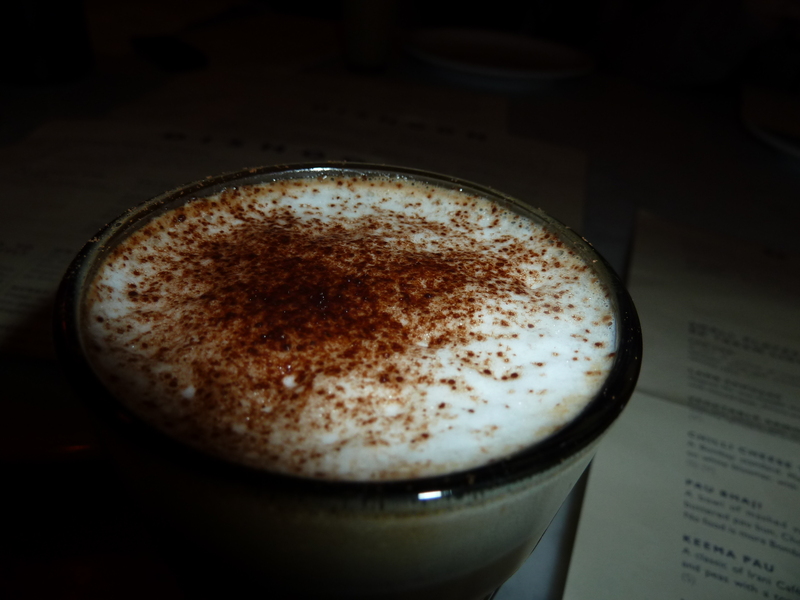 I chose a chocolate chai (£2.70), which I absolutely loved. I wasn’t sure how the combination would work, but the flavour balance was perfect and they’d avoided the temptation to make it too sweet. 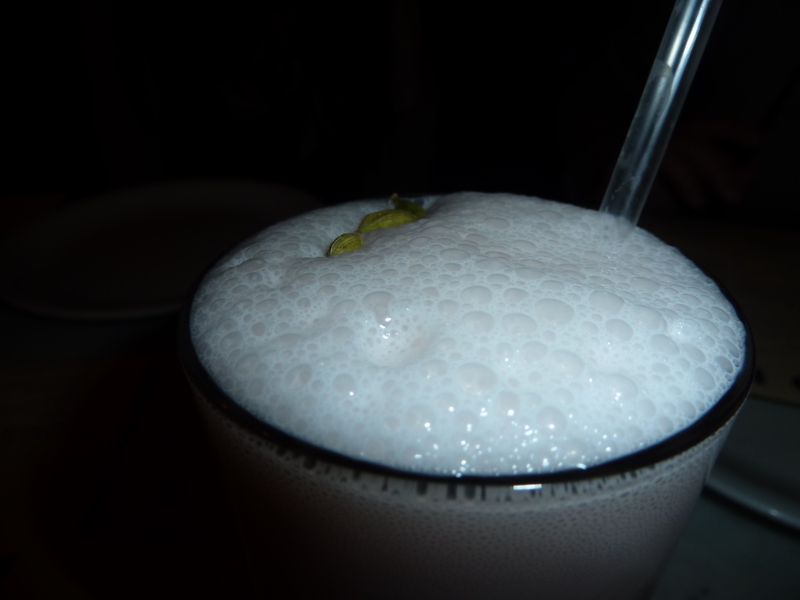 Also worth mentioning was the rose and cardamom lassi (£3.50). Subtle but delicious. Highly recommended. 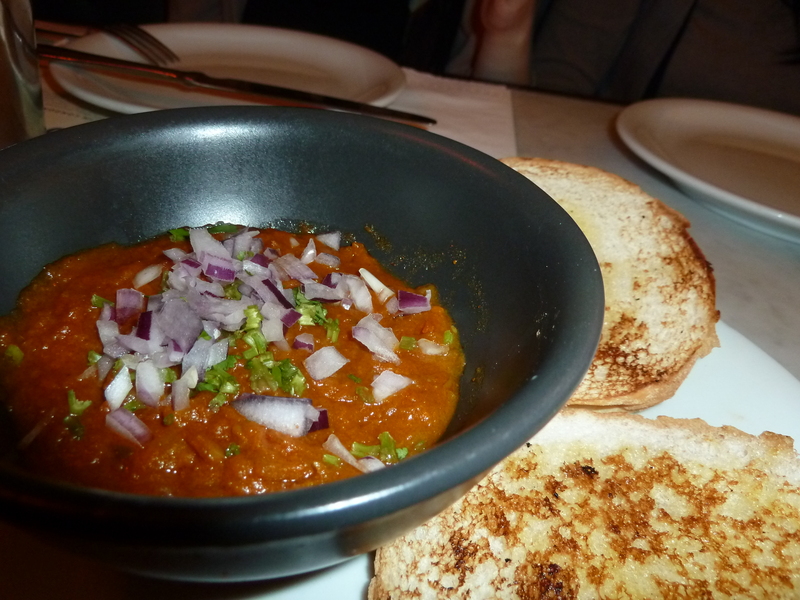 Pau Bhaji – Lick the bowl clean! Next up, we tucked into a range of “small plates, to be taken lightly”. We tried Pau Bhaji (£.390) – “A bowl of mashed vegetables with hot buttered pau bun, Chowpatty Beach style” – which made me want to research flights to Bombay (or should I say Mumbai?) straight away. Thick, rich and delicious, we kept on scooping the vegetable mush after the slightly-sweet bun was finished. 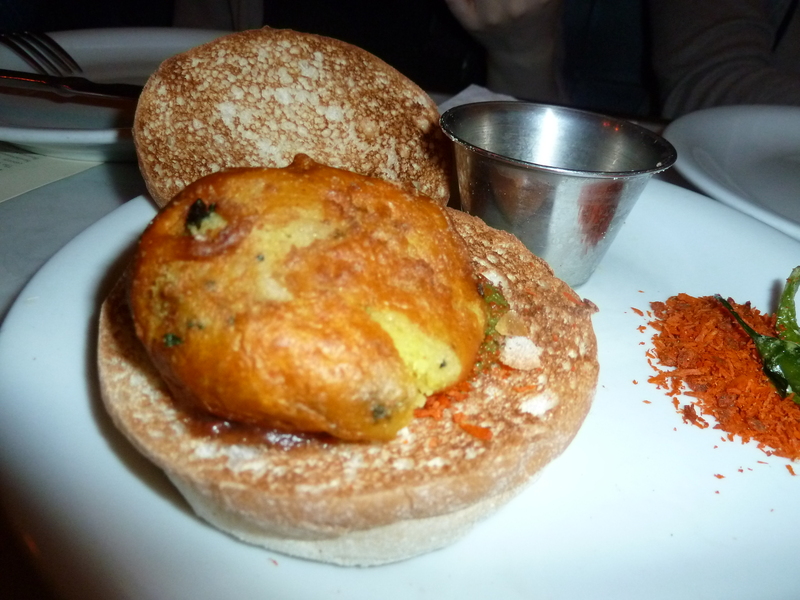 We also tried Vada Pau (£3.90) – a potato patty in a bun. Pleasant but unmemorable. 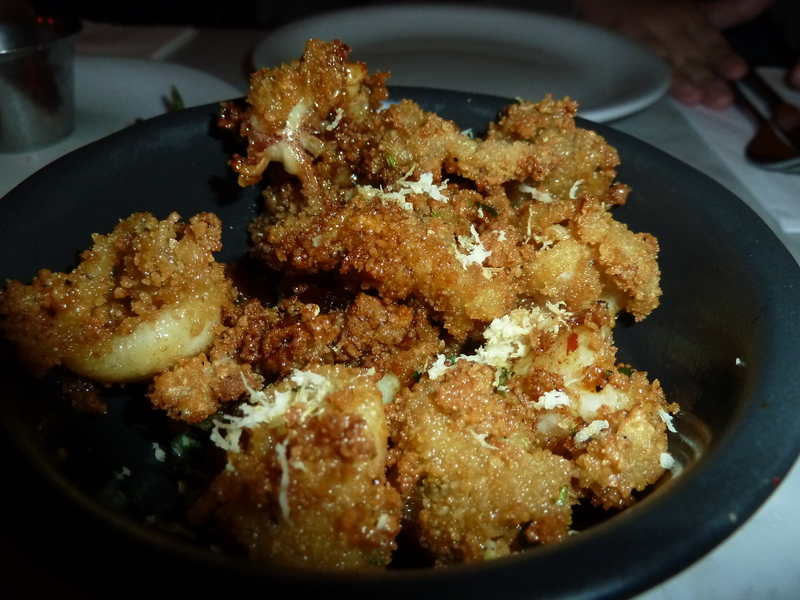 However, do not fail to order Dishoom Calamari (£5.20). They’re light, crispy and so moreish. They’re served with a dubiously named “Dishoom drizzle” – I don’t know what it is, but it’s seriously good. 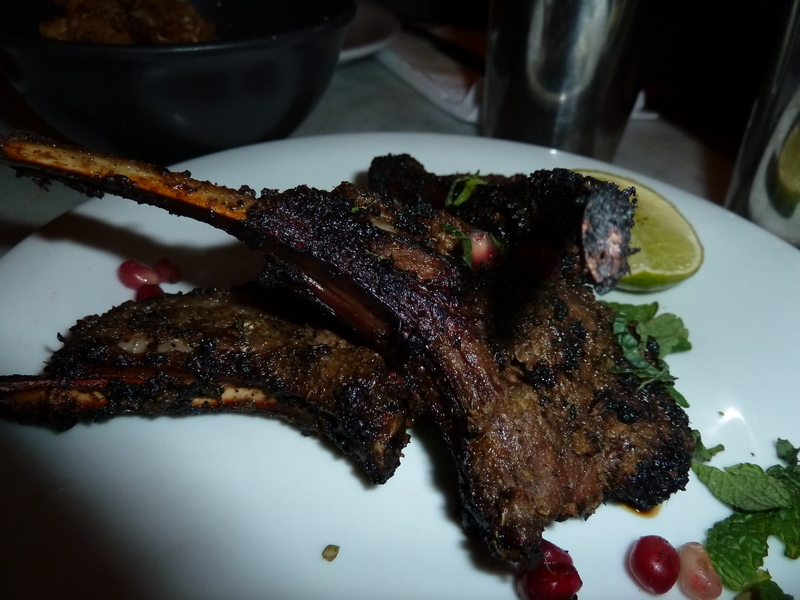 Spicy Lamb Chops – £11.50 really? Next up, we tucked into our grilled dishes. The Spicy Lamb Chops (£11.50) were tender and tasty enough, but fell short of being spectacular because there needed to be more effort put into the seasoning. 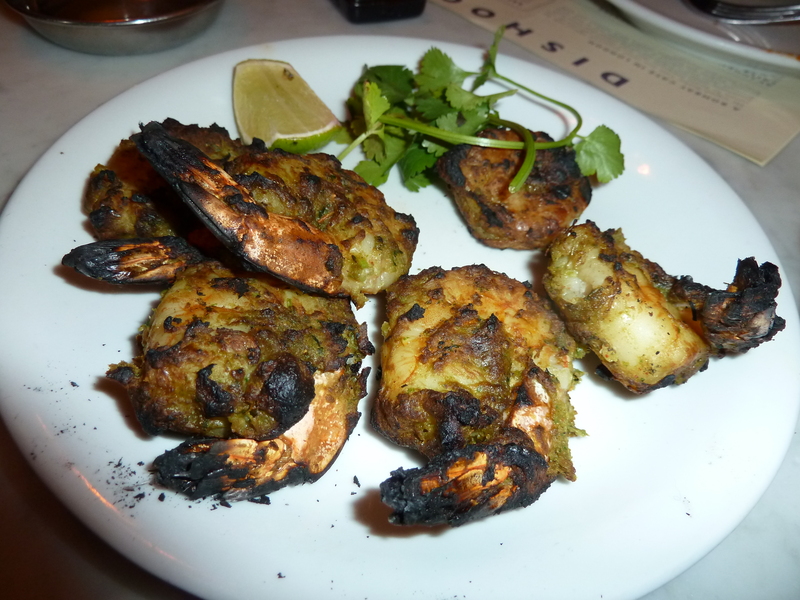 Similarly, the Masala Prawns (£10.50) were more salty than anything else. I didn’t feel compelled to fight with my co-diners over the last one. Because we felt we should have a wet curry, we ordered the Chicken Ruby (£7.90) – “a mellow curry in the South Indian Style” – which I remember to be tangy, and a little dull. 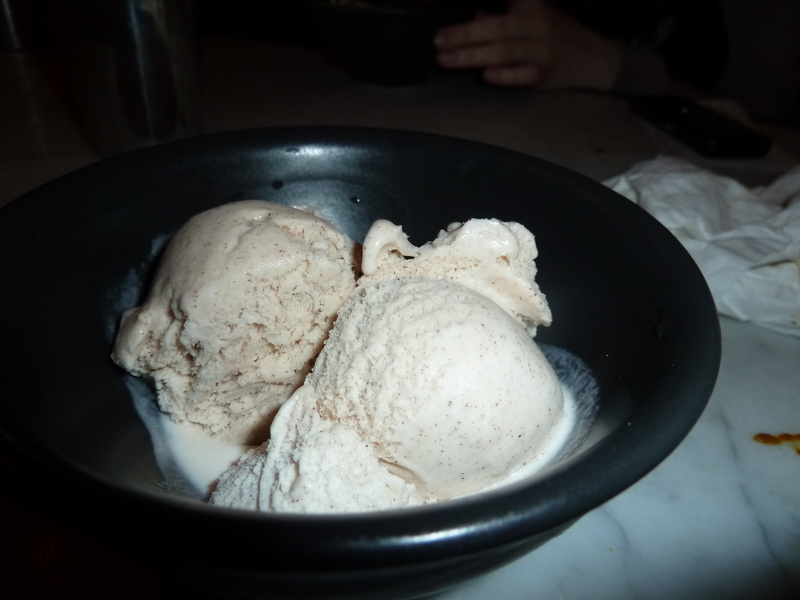 Compelled to finish the meal in style, I ended with Cinnamon Ice-Cream (£2.90), which was reasonably priced for the portion-size but it was a little salty and not as smooth as I like ice-cream to be. An enjoyable experience and enjoyable food, but it could have been executed with greater skill. I hear the Shoreditch branch is the place to go. Food 3.5/5 – All tasty! But we weren’t bowled over. Service 2/5 – As well as the above-mentioned saga, we had to wait a really long time in between visits from our waitress. Value 3/5 – I paid £20 for three-courses, a drink and service, and was satisfied. But the grilled meat is pricey for what it is. 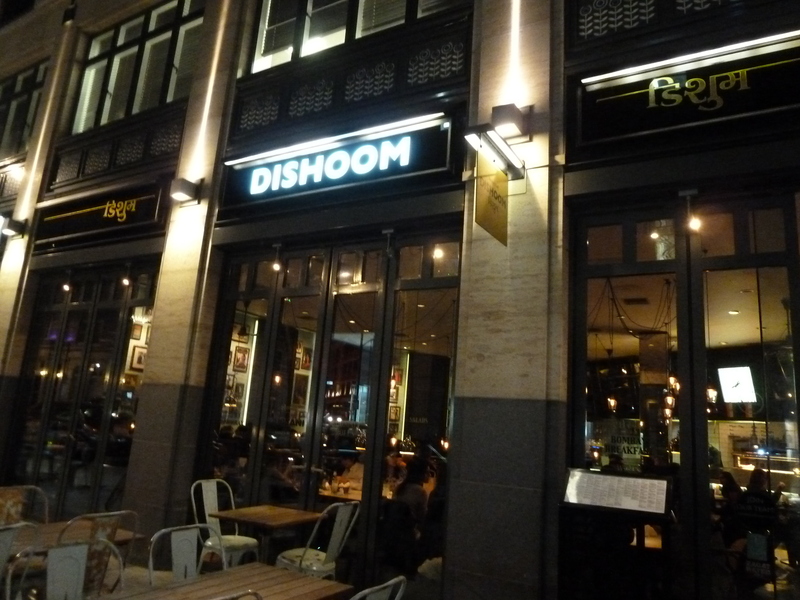 Atmosphere 4/5 – It’s Dishoom and it’s Covent Garden. It’s lively and fun!